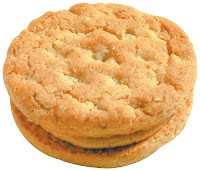 The GS Cookie "What's Your Favorite" online poll suggests that only 5% of us rate Do-Si-Dos (AKA Peanut Butter Sandwich) as our favorite.... but some how, the Girl Scouts report that 11% of cookie sales are for Do-Si-Dos. I guess the people who like those cookies best buy twice as many boxes. Peanut Thai Chicken made with Do-Si-Dos! Peanut Butter and Jelly Ice Cream Sunday Pie. Be sure and check out our other posts, including recipes with other GS Cookies!! For a list of all GS cookies being offered in our region, and to find out how to place an order, click here! And, be sure to stay tuned to learn more about GS cookies, and sales in Loudoun County!